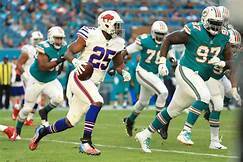 Are the Monsters of the Midway back or can the Fins flip the script again? Some people call it riding the hot hand. Others say it’s jumping on the bandwagon. Either way, the Miami Dolphins are yesterday’s news while the Chicago Bears trend viral like Captain Trips. The two teams meet Sunday at whatever they’re calling the former Joe Robbie Stadium this week. Want to make a splash on this weekend’s games? CharliesSports’ Football Picks won’t leave you lost in the woods. Subscribe now and benefit all the way to the Super Bowl. Sixty per cent of the betting public back da Bears following their spectacular 48-10 route of the Tampa Bay Buccaneers at Soldier Field. Quarterback Mitch Trubisky, whose surname still almost rhymes with ‘who is he?’ threw for 354 yards and six touchdowns while completing 19/26 passes. He also ran for another 53 yards, accounting for 92.5% of Chicago’s offensive output. Head coach and former arena football QB Matt Nagy’s offensive scheme receives the most credit for the Monsters of the Midway’s revival. It seems apropos with Michael Myers return to the screen at month’s end in the Hallowe’en reboot. Mitch Trubisky and Matt Nagy get their signals straight. Meanwhile, the Dolphins are experiencing Donald Trump-like support numbers after two consecutive losses. 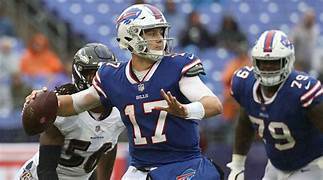 Their uninspiring trip to Foxborough, where the Patriots handed them their helmets, was unsucceeded by a stunning capitulation in Cincinnati despite leading by 14 at the half. Once again, Miami are pretenders in most fans’ eyes. The experts aren’t so convinced. They’re leaning slightly towards Adam Gase’s squad to win this one at home, where they’re undefeated on the young season, despite the line holding steadily at +3.5 for the past two days. Nor can handicappers make up their minds regarding the total [41.5], which at least tells you they don’t expect Trubisky and his receivers to run riot on the road against the stellar Miami secondary. That doesn’t mean the Bears won’t be a handful for the Dolphins defence. Nagy’s system is a fluid attack designed to exploit the soft spots in a defence on a play-by-play basis, using pre-snap motion to force opponents into tipping their hand. If a team is loading up against the run, they’ll go wide or over the top. If it’s spread, they’ll exploit the gaps. Gase isn’t overmatched as a strategist. You don’t jump out to big half-time leads as the Dolphins did against Cincinnati or roar back from behind like they did against the Raiders without decent schemes. The problems are consistent execution and game management. 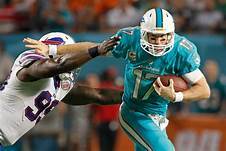 Ryan Tannehill shouldn’t be throwing interceptions with a big lead. He should barely be throwing at all. Pound the ball; eat the clock. Adam Gase searches for a way to make Ryan Tannehill understand why interceptions are bad. Historically, the teams tend to trade wins. The Bears last won back-to-back against Miami in 1994 and ’97. The Dolphins haven’t done it since 1979 and ’85, the second game being the one where Dan Marino ended Mike Ditka’s run at a perfect season. The Dolphins came away 27-14 winners in 2014’s last meeting between the pair. More recently, Miami are 1-4 against the spread versus winning teams while Chicago’s taken the under in their last four after winning by at least two touchdowns. The Dolphins have also gone under in their last four against winning teams. You have to pit those trends against the team’s mood after two embarrassing defeats away from home and their determination to keep their season above water. NFL Dolphins caught in Trump’s net? Immediately following the World Cup Final, Russian President Vladimir Putin left Moscow to meet US President Donald Trump in neighbouring Helsinki. Trump spent his time in Finland before and after the meeting criticizing American allies, casting aspersions on the competence and credibility of US intelligence agencies, and praising Putin. The two leaders met behind closed doors with only translators for company. No advisors. No reporters. Charliessports.com produces it for Football News. Football Picks are the best in the industry and will continue through the Super Bowl in February of 2019. Concerned Americans questioned Trump’s remarks and wondered why he had not taken a stand against the man American intelligence has confirmed authorized Russian interference in the 2016 presidential election. On Thursday, a document describing the Miami Dolphins proposed disciplinary policy for players who refused to stand for the national anthem before games leaked to the press. The maximum four-game suspension met with objections. The NFL and NFLPA released a joint statement indicating new anthem rules would be suspended for several weeks while the two sides met behind closed doors for confidential discussions [no talking to reporters] to negotiate a more amenable policy. Donald Trump took to Twitter, asking why the NFL did not “take a stand” against its players. Critics have laughed at the President’s boasts regarding his fitness. I’m no doctor but it’s obvious there is too much irony in his diet. Before the document leaked, Dolphins owner Stephen Ross had been publicly supportive of players’ right to protest. Apparently, however, he was unwilling to go as far as NY Jets CEO Christopher Johnson who refused to suspend players and promised to pay any fines levied against them. Afterwards, Ross released a prepared statement that labeled the proposed punishment as a “placeholder” for an unresolved policy. Moved backwards faster than the Dolphins defense. Kneeling during the national anthem isn't disrespecting the flag. It's is a peaceful protest. Listen to the words of our anthem carefully because the last few lines ask a very poignant question that is more apt than ever right now. To be clear, the suspended NFL anthem policy did not compel players to stand for the anthem. It gave them the option to remain in the locker room until after the performance. To clarify further, the 1943 Supreme Court ruling did not force employers to tolerate public protests by employees at the workplace. In a free country, neither should be mandatory. The NFL and NFLPA are demonstrating remarkable professionalism and respect by agreeing to negotiate a mutually acceptable anthem policy rather than litigate. You would think that the man who wrote The Art of the Deal would appreciate that. Donald Trump teamed up with Stephen Ross when the New Jersey Generals merged with the Houston Gamblers. The new team never took the field; the USFL folded before its first fall season. Free Pick. Play Online Poker Plus Other Casino Games and enter some of the best Tournaments on the World Wide Web.